Grandmaster Richard Chun's Tae Kwon Do: The Korean Martial Art, published in 1976, is prized by many Tae Kwon Do stylists. Grandmaster Chun, along with Ki Whang Kim, Son Duk Sung, Sijak Henry Cho, Jhoon Rhee, is one of the original Korean masters to bring Tae Kwon Do to the United States. At 630 pages, Grandmaster Chun's Tae Kwon Do: The Korean Martial Art, now in its second edition, is a veritable tome, a complete textbook of Tae Kwon Do. There is much to learn in its pages, including a brief history of the art; basic principles; calisthenics, breathing and meditation; basic stances; walking, turning and lunging; basic striking weapons and techniques; vital points; blocking techniques; kicking techniques; advanced positions and combinations; one-step and three-step sparring techniques; self-defense techniques; breaking with the hands and feet; training equipment; and Ki-cho, Pal-Gwe and Taegeuk forms. If one were to study only one book about Tae Kwon Do, Grandmaster Richard Chun's Tae Kwon Do: The Korean Martial Art would provide a well-rounded foundation of the art as high as 1st gup, even yet today, more than 35 years since the first edition was first published.Several features of Grandmaster Chun's Tae Kwon Do: The Korean Martial Art stand out and make it a must-have book for both advanced and new practitioners. Great care has been taken throughout. In fact, the content and layout of the second edition is indistinguishable from the first edition. The writing is clear and simple, often presented in outline form, so that readers can easily follow along line-by-line, step-by-step, and all photographs are black-and-white and logically placed beside the relevant text in the outline or descriptions to avoid confusion. 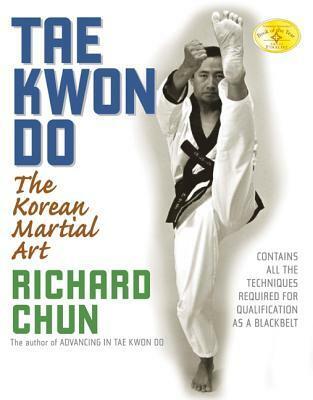 In comparison, most other books about Tae Kwon Do and martial arts in general do not achieve the cohesion found in Grandmaster Chun's book. Instead they print step-by-step sequences in long blocks and paragraphs, and then reference related photographs by numbers or letters or both to a completely different page, all of which make their subject much harder for readers to grasp.The quality of the photographs in Tae Kwon Do: The Korean Martial Art are likewise worthy of mention. They present each stance, technique, or series of movements in sequential order from front, side and/or rear views as needed for clarity, even for the absolute beginner. The photos themselves are not too large or too small, too many or too few, the subject neither too near nor too far. The photos are not crowded on the page to conserve space or reduce costs. If a technique or sequence requires six photos for clarity, there are six photos presented to the reader, no less. It is clear that the publisher of Grandmaster Chun's Tae Kwon Do: The Korean Martial Art chose quality over cost.Tae Kwon Do: The Korean Martial Art presents many classical techniques which are likely to be new to students with less than 30 years of experience in Tae Kwon Do, a result of the evolving landscape of Tae Kwon Do as it became an international sport. More than 250 pages document basic striking weapons; hand, arm, and head attacking techniques; blocking techniques and kicking techniques; and self-defense techniques. Many of these techniques will be new to less-seasoned readers, using not only familiar kick and strikes but also wrists, elbows, forearms, knees, and head in such exotic techniques as the ox jaw strike, thumb-knuckle fist punch, two-knuckle fist punch, tiger-mouth thrust, chicken-beak strike, bear-hand strike, half-moon kick, grab kick, knee kick, handstand double-foot kick, falling kick, stooping turning kick, parry and lift, rock pushing, thrust concentration, and bull block. Grandmaster Chun also describe more than 30 self-defense techniques against assorted grabs, chokes and weapons that employ escapes, joint locks, joint breaks, sweeps, throws and strikes. Discovering these "new" techniques for the first time is exciting, like opening a time capsule, and the conscientious student will ask questions and try the "new" techniques, thereby opening and expanding his mind and his martial art experience.While cataloguing these "new" techniques, readers are likely to notice that the axe kick is inexplicably missing from Tae Kwon Do: The Korean Martial Art. The axe kick was first revealed to the West in 1973 at the inaugural World Tae Kwon Do Games in Seoul. Although the first edition was published in 1976, two to three years after Grandmaster Chun saw the axe kick for the first time, and the second edition was published much later in 2007, there is no mention of the axe kick in either, a curious feature when Grandmaster Chun otherwise so completely documents many other techniques of Tae Kwon Do.Grandmaster Chun also instructs readers in the Ki-Cho, Palgwe and Taegeuk forms necessary to test up to 1st gup. Both editions of Tae Kwon Do: The Korean Martial Art explore Ki-Cho One, one of three basic forms, and all eight Palgwe forms with the same clarity as the preceding techniques and sequences in the book, with clear instructions and photographs to demonstrate each movement. In fact, the eight Palgwe patterns appeared for the very first time in print in English in the first edition. Unfortunately, the basic patterns Ki-Cho Two and Ki-Cho Three, which complete the Ki-Cho series, are omitted from both editions. Grandmaster Chun notes that they are omitted due to space limitations. Since many dojangs still teach all three Ki-Cho forms, it would have been a nice touch to include them in the second edition.Perhaps the most obvious difference between the first and second editions of Grandmaster Chun's Tae Kwon Do: The Korean Martial Art is the addition of the newer Taegeuk patterns. The second edition, however, does not treat the Taegeuk forms with the same diligence as the Palgwe. The descriptions of each movement in the Palgwe forms are presented in an outline format. Each technique starts with the name of the technique to be performed at that point, followed by step-by-step instructions to move from the previous technique and arrive at that point. This format makes it easy for readers to scan the Palgwe forms at a glance as they learn them. However, the descriptions of each movement in the Taegeuk forms lack the foresight and clarity provided by the formatting found with the Palgwe forms. The Taegeuk techniques are described in short blocks of text that, while technically adequate, cannot be scanned by readers as a reference to help them learn the forms. Students, instead, must read each step-by-step paragraph to find the technique they are to execute. The Taegeuk forms are also illustrated, not photographed. While the illustrations are likely adequate, the effect devalues the addition of the Taegeuk chapter, relegating the chapter to an afterthought.Grandmaster Chun's Tae Kwon Do: The Korean Martial Art recognizes Tae Kwon Do as a martial art, a combat art. Many of today's martial arts books, written in the politically correct world of martial sport, seem to ignore that the martial arts were once meant to defeat, maim and kill if necessary. Grandmaster Chun's book does not mask this truth. Many of the self-defense scenarios discussed in the book end with not only a wrist lock or arm bar, but with breaking the wrist, breaking the elbow, breaking the knee and/or tearing the shoulder out of its socket. This brutal honesty is refreshing. Using the techniques described in Grandmaster Chun's Tae Kwon Do: The Korean Martial Art, readers learn without doubt the full extent of the possible damage they can inflict. Tae Kwon Do: The Korean Martial Art introduces today's students, accustomed to tournaments, to a host of "new" techniques they have not likely learned. This is one of the best taekwondo books I've read. Helped me a lot on my martial arts journey. I studied Tae Kwon Do under Min Ho Cho in the late 70's in Northern Virginia. This book was the required text for the black belt program. I studied under Cho for a few years and referred to this manual throughout the classes.